My fiancÃ©e, Brian and I always wanted a second dog. 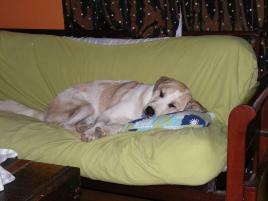 We have a 14 month old english golden retriever named Zoe. She loves playing with other dogs in the neighborhood so we figured at her age it would be perfect to introduce her to a new brother or sister. We decided that we wanted to adopted a dog because we wanted to give him/her a good home and a second chance. 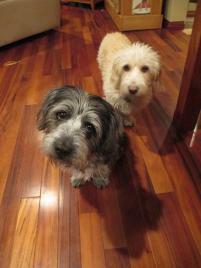 We signed up for Petfinder and put in our criteria and our preferences. We didn't get any matches sent to our e-mail box for a few months but didn't lose hope. We look in our area for a big, goofy, gentle giant but every time we felt we were getting somewhere we ran into obstacles. One January morning, I was sitting at home enjoying my coffee and paper with my dog curled up beside me and decided to check my e-mail. There sitting in my inbox was the sweetest looking dog in the world. 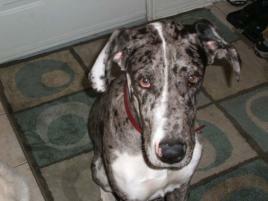 His name was Odin and he was a 6 month old partially deaf great dane. I read his profile and immediately fell in love with this big adorable dog. I quickly researched the demands of having a deaf dog and then filled in the questionnaire that was required from the shelter. Within hours I was scheduling to meet Odin and to my surprise he was being fostered in my area. Brian, Zoe and I went to visit Odin that night and all three of us fell head over heals. We were nervous because there were several other families that were looking into adopting Odin but many were unsure of the commitment of owning a deaf dog. I told both the foster lady and then shelter that I would be willing to do anything for Odin which included paying for all future vet bills i.e. being neutered and hearing exams. The following day Brian and I were surprised to receive a call from the foster lady, Kim, that Odin could be picked up that evening. From that moment on, Odin and Zoe have been inseparable and our family now feels complete. 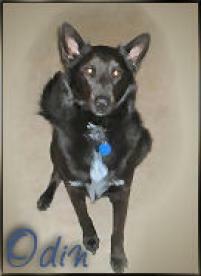 I couldn't be more pleased with Petfinder, Teddy's Railroad or Kim Moore. Without everyone's help we wouldn't have found the perfect addition to our family.